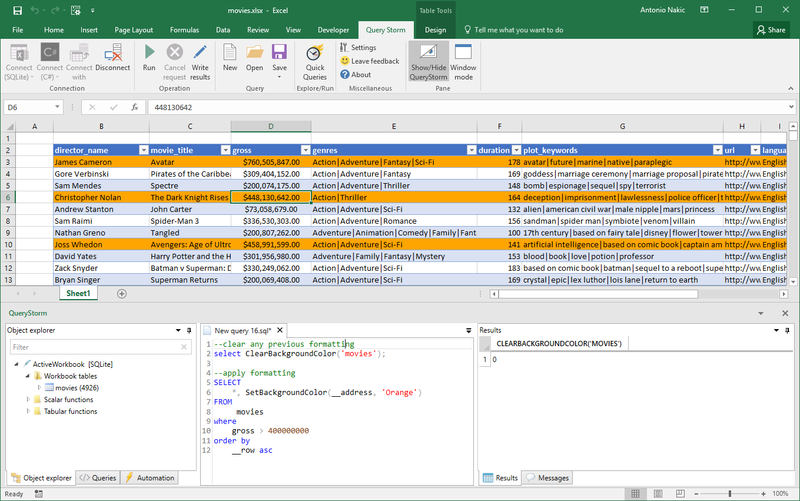 Since the SQLite engine is running in-process with Excel, it can interact with Excel objects. A typical use case for this is modifying formatting. As mentioned before, each table has a hidden __address column which we can use to selectively apply formatting to rows. In the example, we're using the ClearBackgroundColor function to clean any previously applied formatting, after which we apply formatting to the desired rows via the SetBackgroundColor function. It might seem strange to use a SELECT statement to modify row formatting, but it's fairly easy to get used to, and there doesn't seem to be a more elegant way of doing it via SQL.